Born in Shenyang, China, and now residing in Beijing, Chai Liang is a young violinist active on the American and world music scene and considered one the foremost artists of his generation. Chai was born into a musical family. His father is a composer, and his mother, a vocalist. He began learning the piano at the age of five, and the violin at the age of nine. In 1980, he was admitted to the secondary school officiated by the Shenyang Conservatory of Music where he received training under Guan Qingwu, Wang Guan, Jin Yanping and Wu Peiru. Three years later, he was recommended to receive training in the senior high school section of the Central Conservatory of Music in Beijing, under the tutelage of Wang Zhirong. In 1986, he was admitted without audition to the Conservatory proper, where he was trained by famous violinist Lin Yaoji. 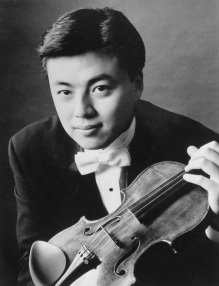 After graduating in 1990, he went to the United States in 1991 on a full scholarship to study violin under Alice Schoenfeld of the University of Southern California. One year later, he received a full scholarship from the Starling Foundation to attend the Juilliard School in New York, where he studied with the pre-eminent violin pedagogue Dorothy Delay, and her associate, Hyo Kang. He was awarded an Artist Diploma (1994) and a Master’s degree (1997) from the Juilliard School. Since then, Chai has been active on the concert stage and serving on the faculty of music institutions: he was a Fellow of the Delay-Starling institute of the Juilliard School, and is currently on the faculty of the Brooklyn College Conservatory of Music. At the same time, he also gives master classes and conducts orchestras in various parts of the world. Chai has won many prizes in his violin career, including the first National Violin Competition for Arts Institutions in China, the second Yehudi Menuhin International Violin Competition in England, and the third Japan International Music Competition. Chai has performed with London’s Royal Philharmonic Orchestra, the Manchester Symphony Orchestra, Sweden’s Gothenburg Symphony Orchestra, the Sydney Philharmonic Orchestra (also as visiting soloist), the Tokyo Metropolitan Symphony Orchestra, the Korean Symphony Orchestra, the Singapore Symphony Orchestra, American Orchestra in New York and Los Angeles, the Grand Canyon Music Festival Orchestra, the Aspen Festival Orchestra, as well as major orchestras of China. Chai has been heard in recitals with chamber orchestras in famous venues around the world, including London’s Royal Albert Hall, Moscow’s Tchaikovsky Concert Hall, Paris’s Auditorium de Louvre, Germany’s Stadisches Konservatorium, the Concert Hall of the Sydney Town Hall, Singpore’s Victoria Concert Hall, Taipei’s National Concert Hall, as well as the three Lincoln Center Auditoria in New York. Chai currently serves as chairman of the String Department at the China Central Conservatory of Music.